A little over two hours ago MLB Trade Rumors released their predictions for the top 50 free agents this offseason, which includes what team they'll sign with and for how much. I think MLBTR does a great job, so I suggest you not only take a look at this post but read them regularly like I do. First off, if you're looking to see what they think in regards to Shohei Otani don't bother. Not only is there no guarantee that he'll even be in MLB next season, but just about every team will be after Otani due to his skill-set and his cheap price tag ("cheap" for what this guy can do, at least). If we had some idea of his preferred destination then perhaps a guess could be made, but I have yet to see anything like that. Secondly, you'll see that they predict CC Sabathia will return to the Yankees on a two-year contract worth $24 million. I'm on the fence with Sabathia. On the one hand I think he'd make a fine addition to the team as a solid starter at the bottom of the rotation, along with his veteran experience to share with his young teammates. But on the other hand I'm concerned with his ability to pitch past the 5th inning with any regularity, to go along with whether he even has spot to start in. I mean, let's say Tanaka comes back (either by not opting out, or agreeing to a small extension) and the Yankees get Otani. That would leave the rotation at Severino, Gray, Tanaka, Otani, and Montgomery. And don't tell me about having other arms available in the event of injury, because the Yankees still have guys like Chance Adams and Justus Sheffield itching for a shot. But there will be plenty of talk surrounding Otani and Sabathia to come. What I want to discuss is the prediction about the Yankees signing Alex Avila to a two-year $16 million contract. Gary Sanchez has taken a lot of flack for his defense. It got so bad that some people thought that he should not be catching. I think that was and still is silly, seeing as how his being a catcher makes his value so much higher, while leaving the DH spot open to rotate players into and out of so that guys like Aaron Hicks can get some well-deserved at bats. But I can't deny that Gary's defense does leave some to be desired, so having a good backup catcher is important. Besides, every catcher needs some rest, and I don't want a guy with an OPS+ of 49 appearing in nearly half of the Yankees games next season (yeah... I'm talking about Austin Romine). 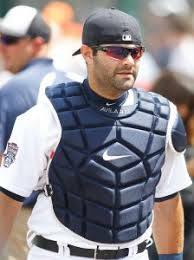 Is Alex Avila on the same level as Sanchez or Buster Posey? Heck no. But Alex is no slouch either. I find it highly unlikely that he repeats his batting line of .264/.387/.447 from this past season, mainly due to an extremely high batting average on balls in play (.382), but I do believe he can provide average to slightly above average offense to the team (I'm thinking of a batting line around .240/.350/.400 with double-digit home runs). I'm sure as one of the better catching free agents that Avila will be looking for regular playing time, if not a definite starting role, which is something the Yankees can't guarantee him. So I'm a bit cynical of this prediction. But it makes perfect sense, and I would actually like to see it happen. MLBTR's pick of Avila to the Yankees has drawn very negative feedback. Nevertheless, I am in agreement with you. I like Austin Romine and his grit, plus the pitchers seem to enjoy throwing to him. But his bat won't scare anyone. I wouldn't want Avila as a starter but as a backup, I think he'd be a solid choice to fill in for Sanchez on those days that El Gary is moved to DH or takes a rest. I'm not sure I would pay $8 million for a player that was DFA'd by his own Dad at one point. An upgrade over Romine wouldn't be a bad idea. I'm just not sure it's worth $8 million for a guy that'll probably get 150 at bats. He was never DFA'd. If anything, he was not pursued by the Tigers (aka his father) when he became a free agent. And after returning to DET he was traded. But no DFA. BTW, Romine got 229 at bats (252 plate appearances), and Avila would probably get more ABs than Austin did. Especially if the Yankees don't pursue a regular DH like they did with Holliday this past season. I agree that $8 million for a backup is a lot, though. But if the team can get under the Luxury Tax threshold, and leave themselves room for making improvements during the season, then I think they should go for it. Especially since they don't have a good backup catching option already in the organization. He was granted free agency after 5 years of major league service in 2015. Whether you call it being non-tendered, or DFA'd, it's the same difference. Your team doesn't think you're worth what your going to cost in arbitration. By the way, Romine got 252 plate appearances because Sanchez was out for a month. Never would have happened if he was healthy all year. Alex had accrued enough service time after the '15 season to gain free agency status. He debuted in August of '09. '10-'14 were full seasons, and '15 was another partial season. Yes, Romine got more at bats due to Sanchez going on the DL, but... like I said... without a regular DH like Holliday the backup DH next season will get more at bats. As much as I hate to admit I'm wrong, I am here. Avila signed a contract in 2014 with an option for 2015, which was picked up. And then granted free agency after the 2015 season. Maybe I just thought it was strange because he wasn't resigned.